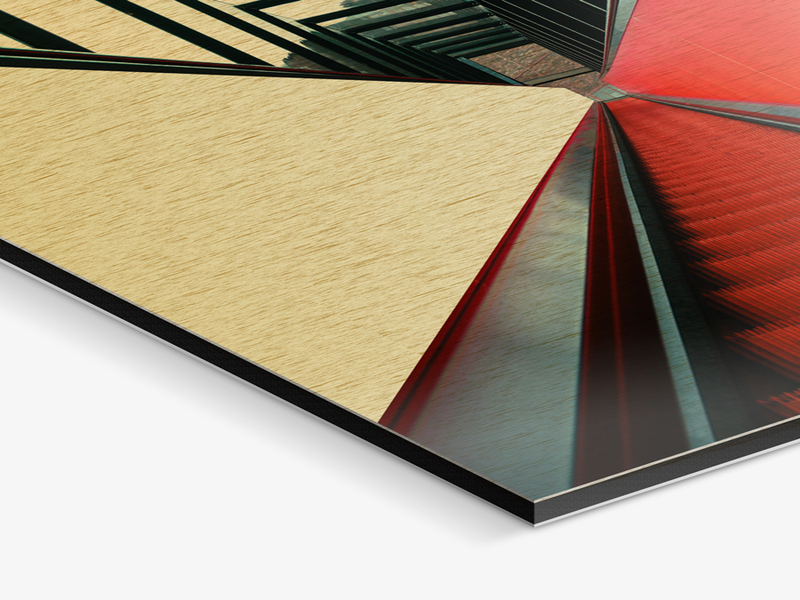 The horizontally brushed surface adds a striking special effect to the timeless design of images on aluminium Dibond: a metallic shimmer of bright and white image areas. You can choose between a metallic effect in silver or - and this is new - in elegant gold. The high-quality photo print on aluminium Dibond Butlerfinish is waterproof and suitable even for sheltered outdoor areas. 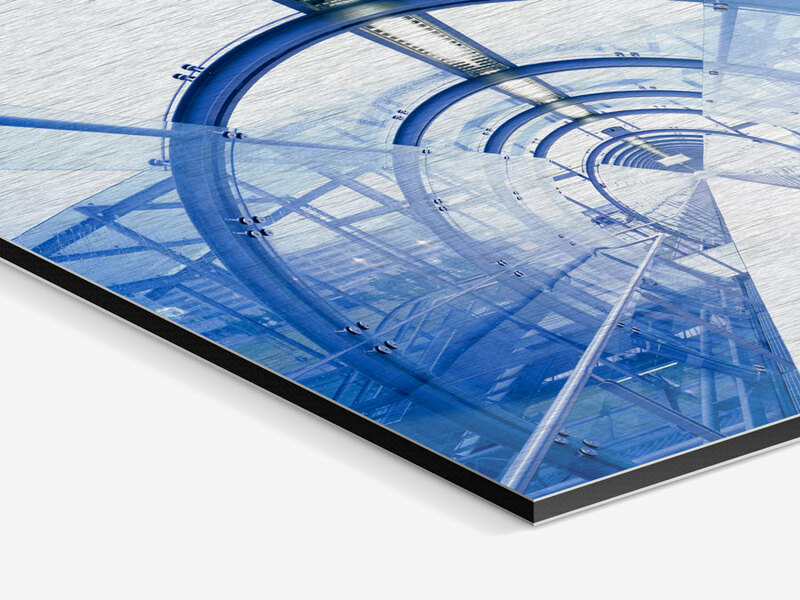 To produce our Direct Print On Brushed Aluminium, your photo is printed straight onto the surface of a gold or silver brushed aluminium Dibond panel. We use UV Fine Art pigments for this modern 7-colour print for a matte finish. The bright parts of the image are omitted from the print, leaving the brushed aluminium visible for a unique metallic sheen. The shimmering look of the textured surface produces an exciting contrast to the intensely vivid colour and precise detail of the print. For certain photos, this is a very special look! For our brushed aluminium pictures, your photo is printed directly on aluminium Dibond, a sturdy composite material. That consists of two aluminium panels and a black polyethylene core. The face, where the brushed finish is applied, is available in two colours: silver, or our NEW gold version. This three-layer material is just 3 mm thick and low in weight. The print is cured with ultraviolet light, protecting it from light damage, dust particles, and moisture. This makes it perfect for large-format prints, even if they are displayed in sheltered outdoor areas or bathroom. 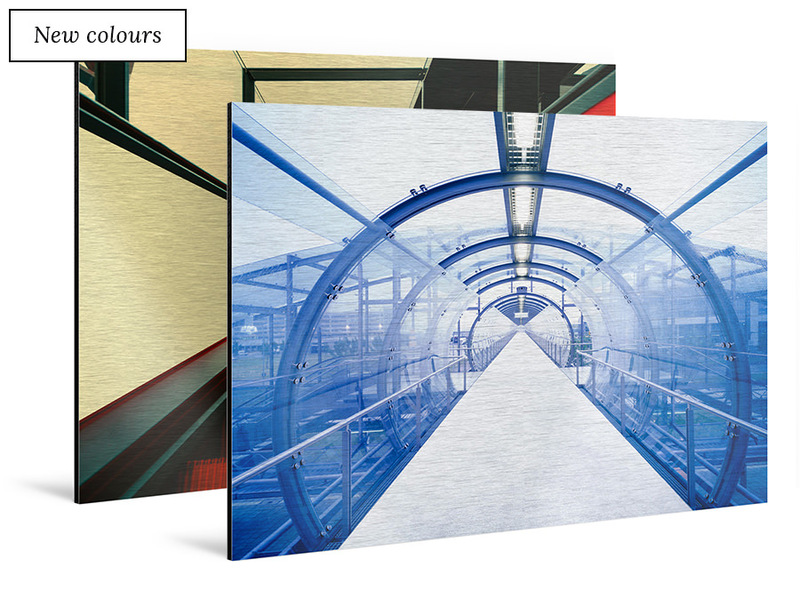 We offer prints on brushed aluminium from pocket-sized up to extra-large. We produce the piece in the exact size and format of your choice. 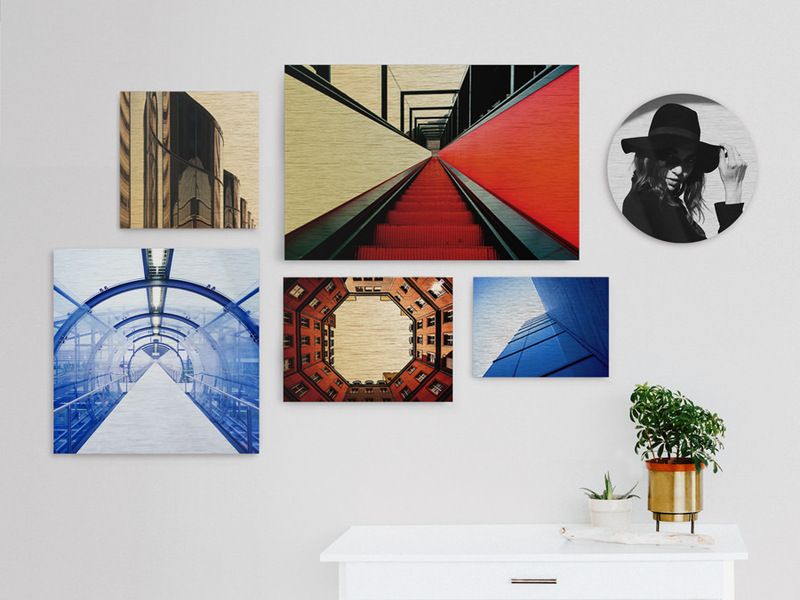 With the wall-mounts included in the purchase price, your photos on brushed aluminium Dibond arrive ready for the wall. Depending on the size of your picture, we install hardware to hang it securely. Simple, secure, and included in the price! Of course, while placing your order, you can also opt to have your picture produced without hanging hardware. Our prints on brushed aluminium Dibond always arrive ready to hang: the aluminium rails attached to the back are included in the standard price. You can also have your picture framed to set a custom accent with a visual border. Our frames also arrive ready to hang in both portrait or landscape orientation. We have over 100 frames to choose from. With regard to photos, we are always wondering whether to rely exclusively on the effect of the image or whether to use an external vehicle to support its intension. The latter can be achieved with a frame that adds focus, a mounting under acrylic glass that enhances the effect of depth or rather by means of special distinctive features such as metallic gloss or a striking surface texture. The photo print on aluminium Dibond Butlerfinish presents your work with both of these distinctive features and therefore creates a hint of flamboyance. Certainly not suitable for any image, but for quite a few ones: it is a conspicuous product for selected works. The horizontally brushed aluminium surface shines through in bright and white picture areas – a modern look with metallic gloss in the bright areas. This effect is particularly suitable for example to present free-standing objects or for images with metallic surfaces. For maximum printing quality, we at WhiteWall use the newest inks. Set with a 7-colour printing technique, they harden under ultraviolet light and form a matte surface. Thanks to this method, the print is protected additionally against dirt and spray water and the colours will keep their radiance. Consequently, the photo print on aluminium Dibond Butlerfinish is also well suited for sheltered outdoor areas and bathrooms. But if the motto is "back to the roots" because an image requires a traditional photo print without any room for extras, you can also have your real photo print mounted on stable aluminium Dibond. The wide range of papers offers you more options than for prints and allows you to make the most of your image by selecting the right photo paper. Protective laminate also ensures excellent protection of these works, which, however, are not intended for bathrooms or outdoor areas. The photo print on aluminium Dibond is less flamboyant but just as robust. Its matte finish has a more discreet effect and the bright areas will only shimmer subtly. The HD Metal Print is a premium print and burned into the coating of the aluminium by means of thermal sublimation, a special process technology. As a result, its shiny look comes with overwhelmingly saturated colours and is extremely robust. Therefore, the print is particularly suitable to hang permanently in outdoor areas. It will not be damaged and is a popular choice for colour-intensive images with strong contrasts whose brilliance should be preserved for a long time. Even in rainy weather, looking at a HD Metal Print is a radiant experience. Give due attention to your photo and look for the suitable presentation mode at WhiteWall. As soon as you have found the right solution, we will guarantee you top quality. Permanently.